Walking into the forest provided a sharp jolt to the senses. The light dimmed, the air became thick with moisture, and the silence was broken by the hum of insects and calling of birds. From here several hours of rugged, slippery trail at times covered in knee deep mud would lead us to camp. 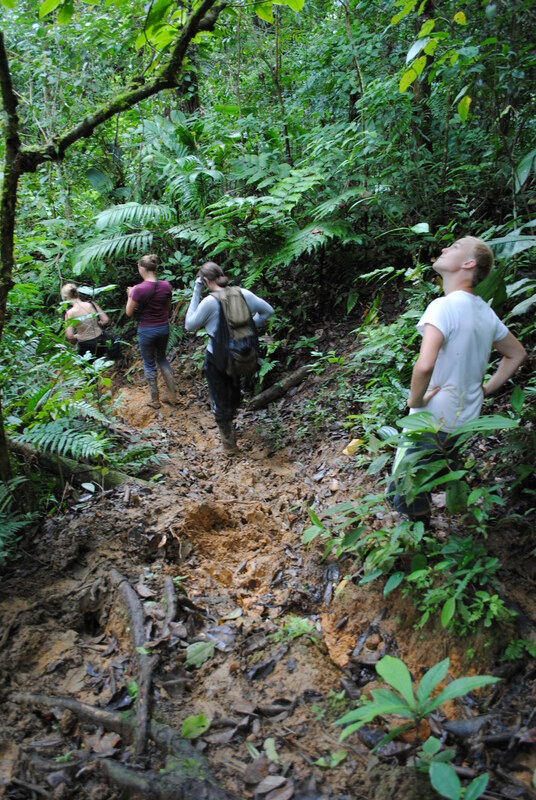 Our guide, Jorge Salvaterri walked easily through the difficult terrain casually describing phenomena of the intricate ecology. We moved at a good pace despite the frequent stops for birding or other observation. Fire ant marches meant great opportunities to see birds and on our trek we spotted honeycreepers, manakins, trogons and tanagers (we never saw the ants, the array of birds let us know of their presence). A coral snake slid under decomposing leaves and bullet ants marched alongside our mud caked Wellies. As first time visitors to the rainforest, it was fascinating how evolution had blended in life to feel absent to everyone but the most trained observer. Luckily, Jorge’s finely tuned techniques let us know of any life within eyeshot or earshot. Even the smell of the forest played a role and it wasn’t long after we entered the park that Jorge stopped with his nose in the air. He smelled pine. While pine trees no longer grow in this area, remnants of old pines can still be found and their oily resin is highly valuable in the forest – just a few slivers can start fires in the wettest conditions. 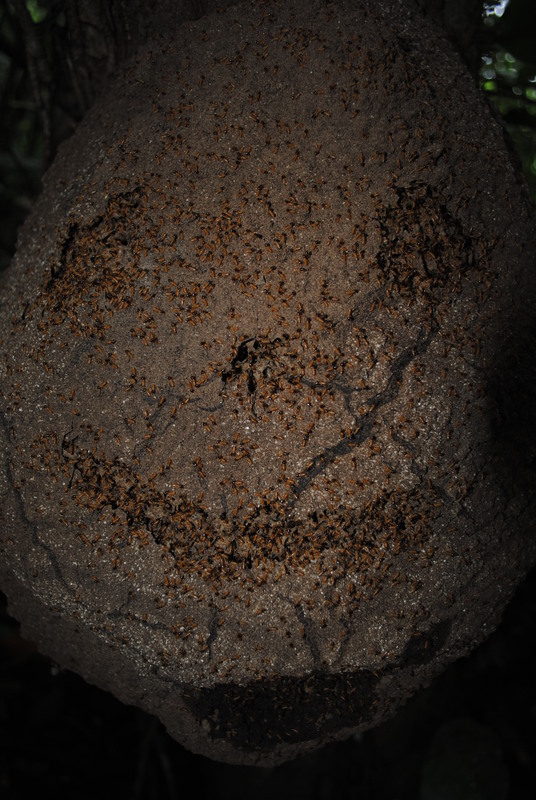 Further ahead, a termite’s nest gave us a chance at some extra protein and a taste of the forest’s variety. To our surprise, their woody peppery flavor is actually quite enjoyable. 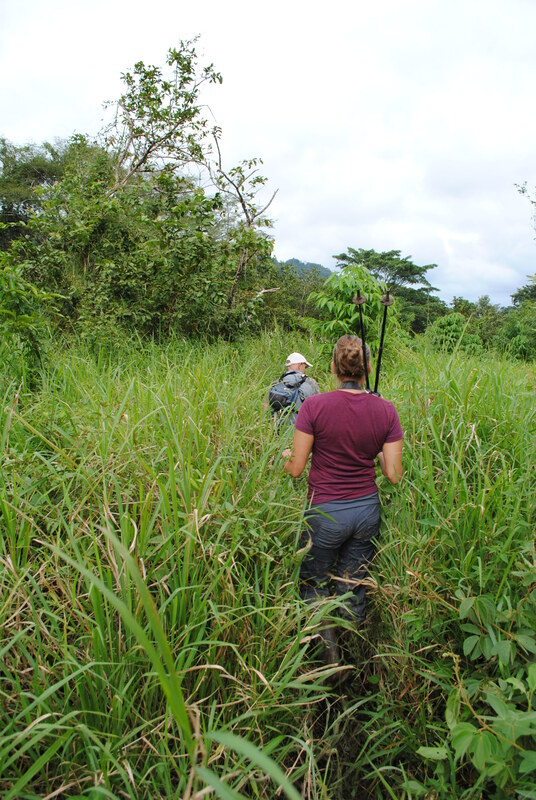 After hours of battling muddy hills and tripping over knotted roots, the final hours’ hike through the grass of a recently burned stretch of forest sounded like it would be a breeze. It was anything but. The mud was even worse here. The thick sharp grass stretching well overhead nicked our arms and obscured the rocky hazards near our feet. We stumbled our way through this mess with a constant cloud of mosquitoes around us. This grassland had been illegally clear-cut and grazed several years prior. Now the jungle was creeping back at tremendous speed. 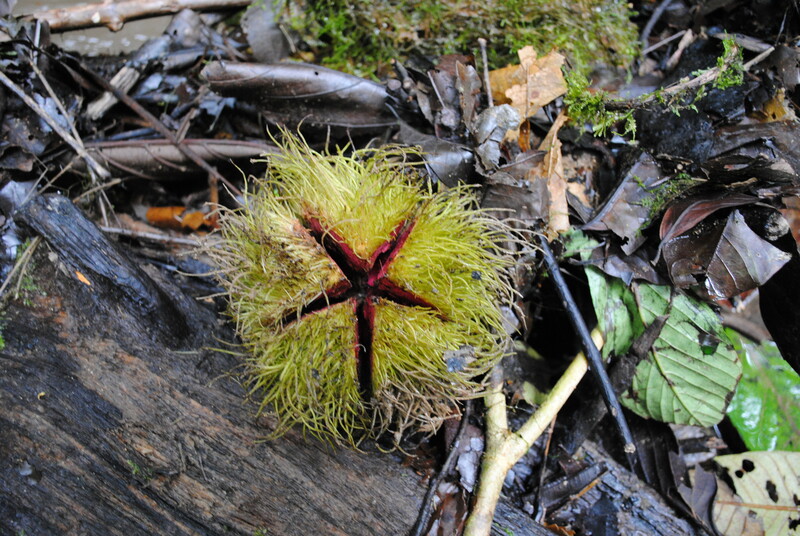 Jorge would point out again and again the forest’s ability to regenerate. Already, the first tree species to return in second growth forests, Cercropia and Balsam, were standing thirty feet high around us. Our first camp was located on the far side of the grasslands. Here at the source of the Rio Platano we unloaded our bags under a tin roof shelter built by the cattle farmers. Under the sunny late afternoon sky, we rested from the long trek and watched the flocks bright green parakeets pass from tree to tree. 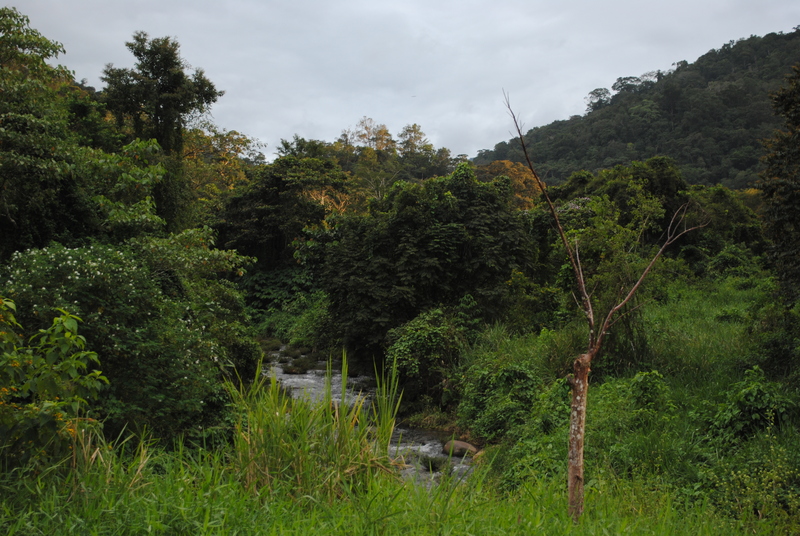 All around the grassy valley were hills covered in dense forest. This scenic patch, which could easily turn to cattle land once again, is central to Jorge’s concept for saving the park. 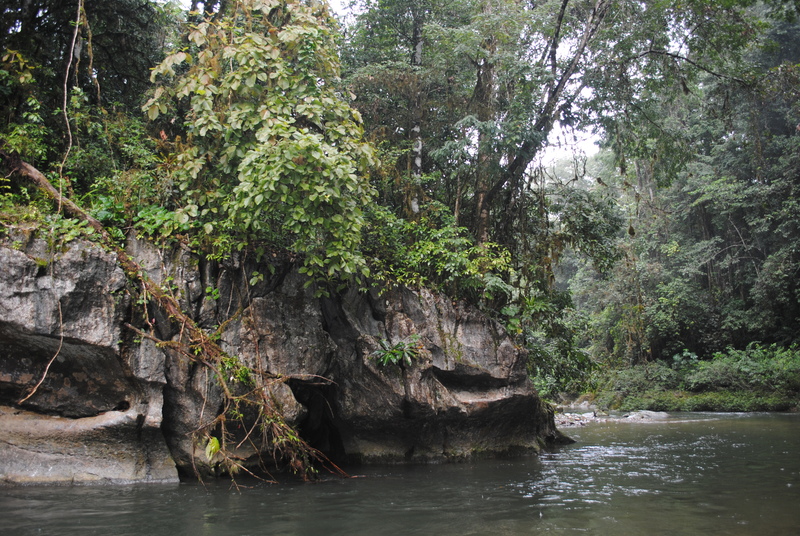 Because of its rugged terrain and impassable forests, the Rio Platano Biosphere is accessible from only two entry points, one of which is here. A small military post at each would effectively guard nearly the entire park. The soldiers, who would need to be paid a fair wage so as not to succumb to bribes, would ensure that guns and nets were not allowed within the park. In Jorge’s opinion, their salaries and expenses could be funded by constructing very basic guest accommodations and a small research facility. With the right logistics in play, both naturalists and researchers could base themselves here and hike or raft into the park’s interior documenting and studying the park’s vast array of species. Albeit, clearly, conservation anywhere is not easy, Jorge has received threats for his out-spoken condemnation of the hunters’ illegal actions. We awoke early to cloudy skies and prepared for our first day of rafting. 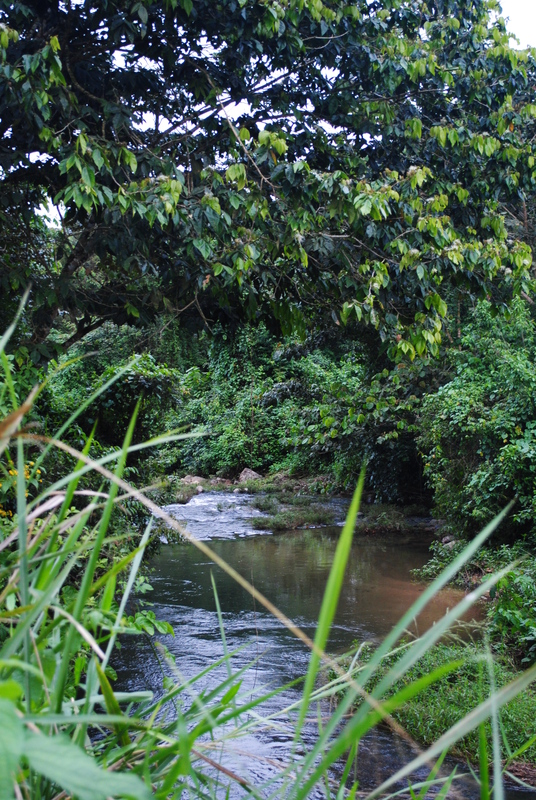 The next morning a fer-de-lance, one of the jungle’s most poisonous snakes, was documented swimming casually where we’d be entering the river. 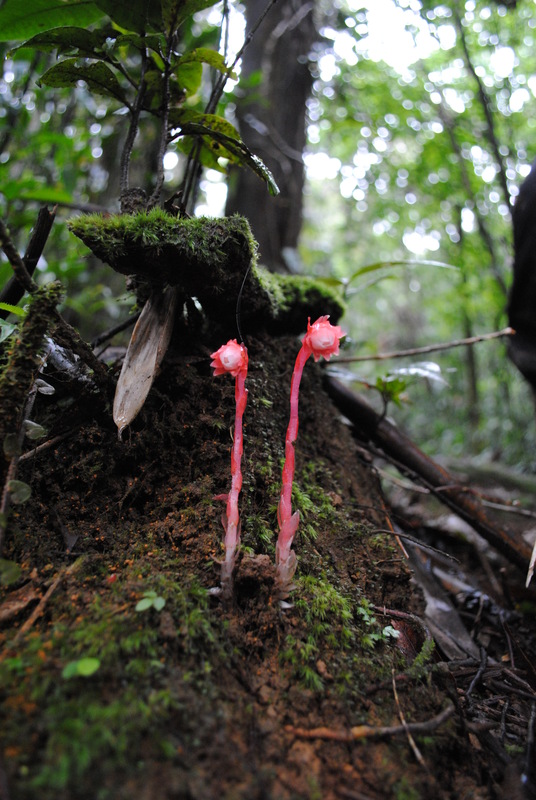 We began to get a sense of the number of predators and prey that must be lurking the forest. However, we would have little time for wildlife spotting that first day. The river during the first leg was still quite low. Water rushed between jagged rocks and at times the water level dropped to only inches deep. For the next eight hours we would be in constant motion. Weaving through successive hazards, Jorge shouted directions as we struggled with our paddles to keep up. Over and over we would get held up on large rocks and would have to jump overboard and drag our raft through the rushing water towards a passage. Heaving ourselves back onboard before the raft rocketed downstream without us was the major challenge of the frequent and irregular shallow water. 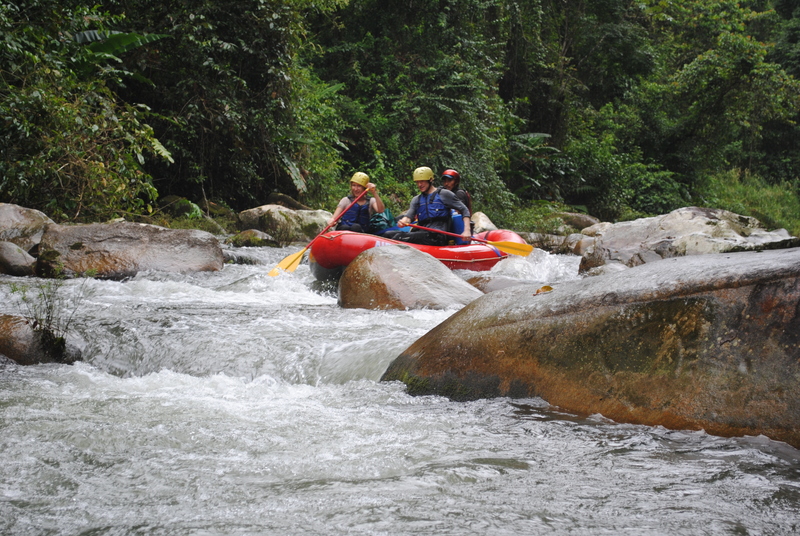 The 20 minute rafting orientation prior to embarking didn’t play as great a role in my rafting skills that day as the sheer terror of landing face first on one of the many huge boulders scattered bank to bank did. However, the rush of the frigid water and the constant array of obstacles ahead were exhilarating as much as they were terrifyingly exhausting. We arrived at our first jungle campsite completely drained of energy, but still couldn’t hold back a few good laughs from the day’s events. Umberto, Jorge’s right-hand man and the captain of the second raft, quickly went to work with his machete to clear our camping area. It had been a year since they were last here and the forest had quickly reclaimed the area. The rain began just after we set up our tent and the tarp canopy the group would congregate under the remainder of the evening. The night would prove our tent’s defenses against extremely rainy conditions were pretty meek. Water ran inside the tent from several locations as I made adjustments and muttered obscenities under the sheets of rain. I would find myself tweaking the rain tarp several more times throughout that sleepless rainy night. The next morning we were awoken by the low guttural calls of the howler monkeys. Their call, particularly when heard first thing in the morning, is frightening. Howler monkeys are the loudest land animals and their fierce grunts warn other troupes to stay out. Though we would hear howler monkeys each morning, it would be several days before we saw our first troupe. Morale was a bit lower the next day. Our hands were blistered and our bodies sore, the rapids that we greeted with excitement the day before we looked upon with a mild sense of dread. This was only compounded by a ceaseless, chilling rain. 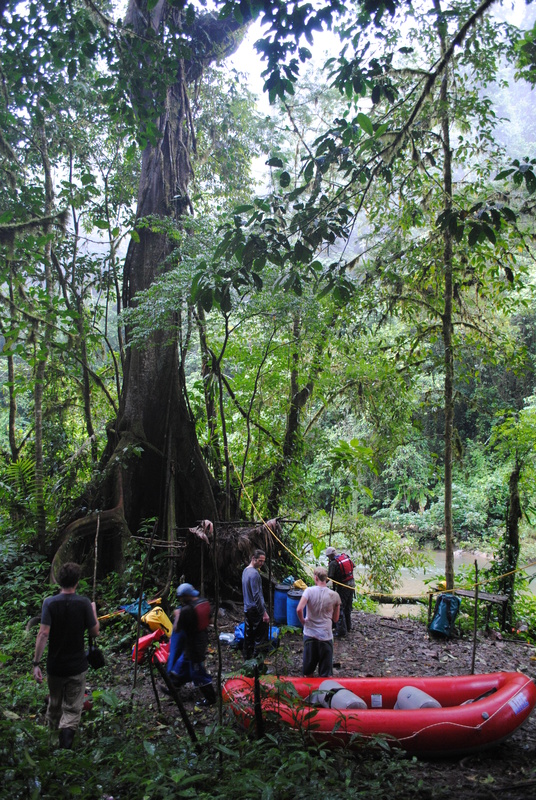 The thick jungle scenery took on a surreal nature when obscured by the wet weather and, gratefully, the downpour had caused the river to rise over a foot submerging obstacles and giving us more frequent opportunities to sit back and enjoy. 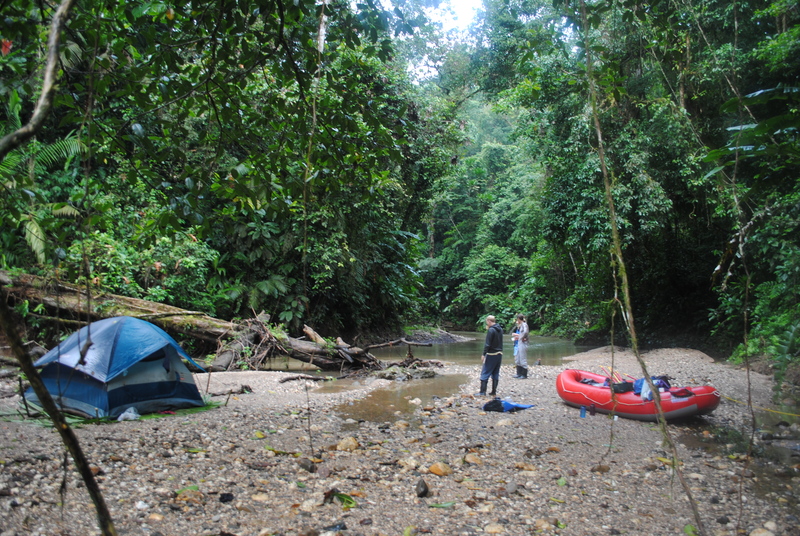 Several hours down the river, Jorge pointed out a hunting camp which had been occupied within the last day or two. Hunters are the biggest immediate threat to the Biosphere’s ecosystem. They follow the river setting fish nets and hunting for deer and tapir and sell the illegal meat at regional markets. Little sleep was to be had again that night. After waking up to yet more rain the next morning, I sat under the tarp sniffling and scratching my numerous insect bites. 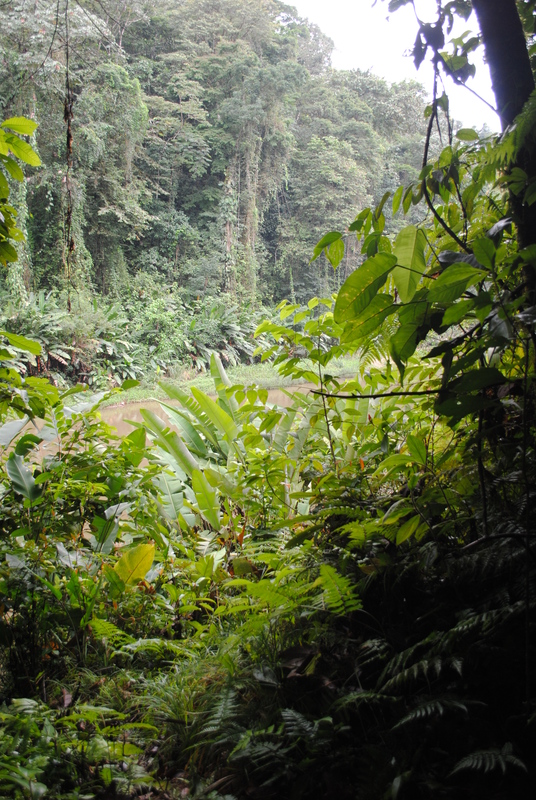 Certainly the jungle can be an inhospitable place. Care and extreme attention to detail must be taken as you plan every moment of your existence there. Plans must be adaptable and able to change instantaneously in the worst possible conditions. Army ants caused us the frustration of relocating camp one afternoon, and from day one we were warned of the tent destructing tendencies of leaf-cutter ants. Certain plants when touched caused terribly irritating rashes and others made us more closely resemble pincushions. Even in the raft we weren’t completely free from unwanted contact with the jungle’s most hostile inhabitants. When passing under vines it was always possible to be greeted by a snake stow-away, and one particular day bullet ants fell from the sky. However, this is what we had travelled to the other end of the continent to do. So we put on our wet socks, washed the mud out of our wellingtons, and hopped in the rafts. By mid morning the weather had started to clear. The hot sun quickly restored our spirits. While we continued to face larger sized rapids, they were spaced farther apart in the ever-widening river. This gave us much more time to gaze around and take in the jungle. We were surrounded by a canyon of leaves. The endless canopy towered over us. Scarlet Macaws crossed the river overhead. Timid iguanas sunning themselves on rocks and overhanging trees would leap and flop into the river upon our approach. The skies above would occasionally sparkle with the sun’s reflection off the iridescent blue wings of the Morpho Cypris butterfly. Shortly after lunch, we had reached a fairly tranquil stretch of river. A loud cracking sound broke the calm and our eyes shot to the river bank. Less than thirty away the tall grass swayed with the movement of a large fleeing form. A small cat appeared and froze at the sight of our raft. It was a jaguar cub. Its mother had jumped into the jungle when it saw us creating the sound. The inexperienced cub had ran toward the shore and panicked. For a brief moment everything was still. The cub was so close we could make out the individual black spots against its amber fur. Then, coming to its senses, the cub retreated into the jungle after its mother. We floated away stunned. The jaguar is one of the most elusive animals in the world. With the exception of isolated sections of jungle, the jaguar has declined nearly to the point of extinction due to poaching and more recently habitat loss. Even where they do survive, the jaguar’s stealth movements and wide range mean they are almost never seen. Jorge is overjoyed like the rest of us. He has been traveling this river for thirty years and this is only his fourth jaguar spotting. It’s the first wild cub he’s seen. The spotting of the jaguar is a good sign of the ecosystem’s health. The existence of a healthy breeding population of large cats illustrates that there is a bountiful web of species in the food chain below. However, as hunting continues to increase in the park, all populations will inevitably suffer. Hunters don’t directly target the jaguars now but they decrease the population of tapir, peccaries and deer that the cats depend on for survival. 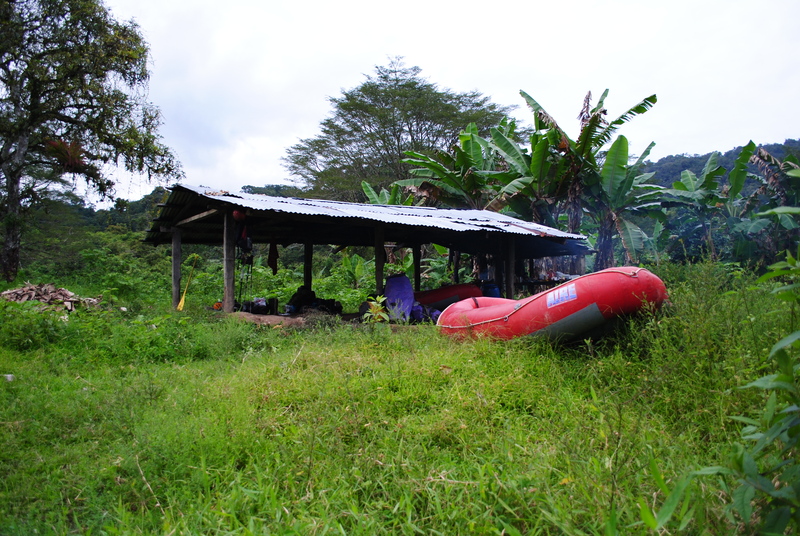 We arrived at our third Jungle camp earlier than the previous day. Finally we had the time and weather to swim and clean up. Fresh fish was caught for dinner. Enjoying the river’s bountiful gifts and recalling the afternoon’s events around the fire, the difficulties over the first days melted away and we felt supremely grateful to be tucked away in this magical place. 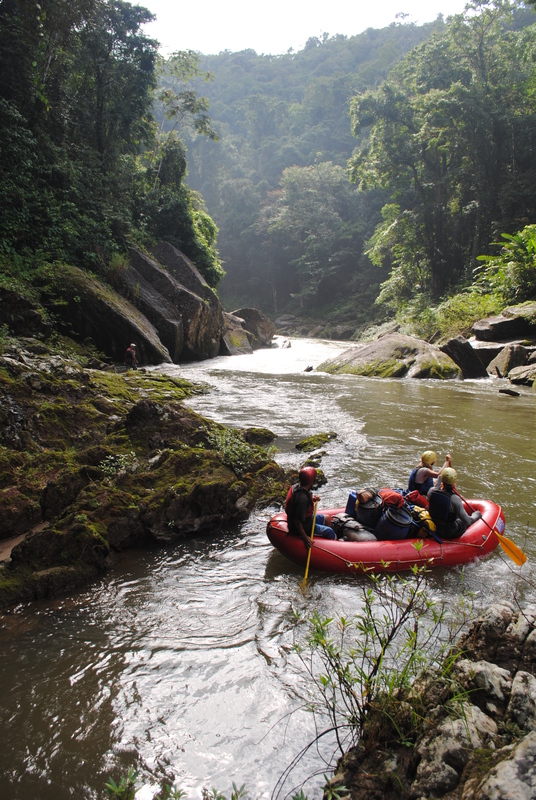 This is the second in a series of posts based on an eleven day rafting expedition to the Rio Platano Biosphere in Honduras during the winter of 2012. Our trip was organized through Jorge Salvaterri of La Moskitia Eco Adventures (https://www.facebook.com/moskitia). They offer a variety of well guided trips throughout the region.